Our picture of the week is one of the most surprising images in any of the collections available on BiblePlaces.com and LifeintheHolyLand.com. 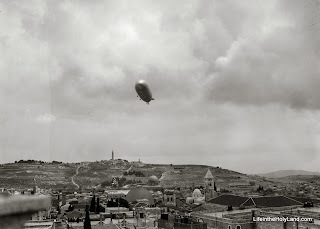 It was taken on April 11, 1931 and displays a German dirigible floating over Jerusalem. Several familiar landmarks can be clearly seen in the photograph. (You can click on the image to enlarge it.) The dirigible is hovering over the Church of the Holy Sepulcher, and the Dome of the Rock can be seen in the background just above the church's dome. To the right is the tower of the German Lutheran Church, and framing the whole scene in the background is the Mount of Olives. The photo comes from Volume 2 of the American Colony and Eric Matson Collection which focuses on Jerusalem. 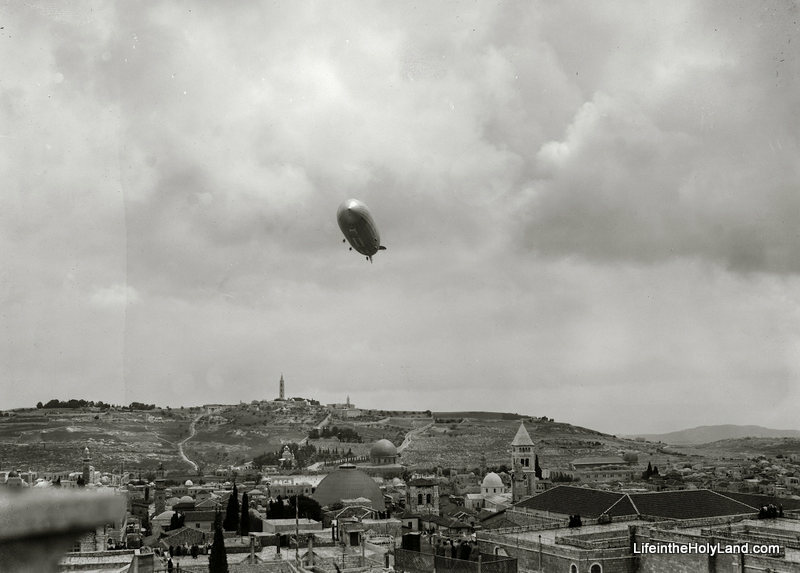 There is another photo of this zeppelin in that collection which shows a clear profile of the airship as it passed by the Citadel of David near Jaffa Gate. This particular zeppelin traveled the world over the course of a decade. It crossed oceans, traversed hemispheres, made a "round the world" voyage, and even helped explore the Arctic. With such a colorful career, I guess it couldn't resist squeezing in a quick trip to Jerusalem at some point. This photograph and over 650 others are available in Volume 2 of the American Colony and Eric Matson Collection, and is available here for $25 (with free shipping). Further information and images of Jerusalem in the 1800s and early 1900s can be found on LifeintheHolyLand.com here, here, and elsewhere. Further information on the Graf Zeppelin can be found here and here. Smacks of Indiana Jones and the Raiders of the Lost Ark.